Nothing too complex, and its very generalized, but here is a small chart summarizing things for beginners when they are faced with the bewildering choice of servos available these days. There is a "discussion thread" running over HERE. 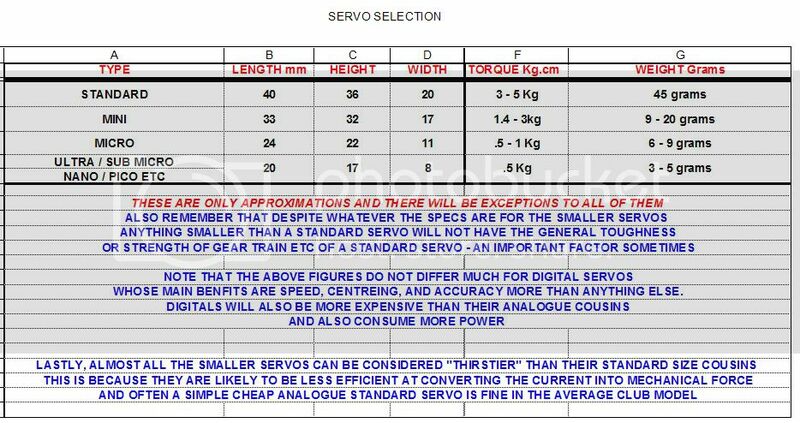 15 articles And heres a link to a very useful calculator which should help in choosing the right servo for you application. It takes into account the major factors such as control surface size and model speed. i'm planning on building an acrowot over the coming months,& wondered which servos you recommend?.I have a DX7 & my trainer has spektrum 821s.which are about £12ish at the momment,but i've noticed some Hitech 325 & 322's for under a 10ner. I know it seems like penny pinching but it would go towards buying my reciever,so i was just wondering what you all advise.? in an Acrowot - even the cheaper HS311 will be fine. Thnx Richard , I'll add them to my shopping list. Hi Guys, wondering if anyone can help, I have a Blackhorse Thunderbolt with OS 91 4 stroke, 60 size & i would love to know can I use a regular servo like a Futaba S3010 rather that what is currently in the plane (JP Supertec S136GH Retract Servo. Reason is that the s136 is not proportional & it is impossible to set up. Thanks in Advance, John. 15 articles Well I assume you mean as a retract servo? You can use a regular one, but be warned that the gear train on retract servos is especially designed to provide the power needed for the job, so choose a metal geared high torque servo. TBH, there is no reason why you shouldnt be able to setup the "proper" retract servo to get the geometry right. It can be fiddly....but is do-able. I thought it might mean weight, but it seems one can find 9g servoes in all weights. Could it mean they're tested to operate at 9g acceleration or what? I find it hugely annoying when looking at planes on the net to see "just needs 4 9g servoes to complete". WHICH 9g servo? There's hundreds! If I was an experienced flyier who know what was needed I wouldn't be surfing for a trainer anyway! '9g' has become a bit of a generic term used more to describe the physical size of the servo than its' actual weight. Some '9g' servos will actually weigh 9g; others, metal geared and ballraced, will probably be nearer 12g. However, I still don't really understand. Or better said, I still don't know what to order when looking for a trainer and the web side states "needs three 9g servoes". What do I buy? 9G seems to be such an inclusive term it means nothing. Just looking at some of the model shops linked on this site, and looking at the trainers on offer that merely need a couple of 9g servoes to complete, every single web side has at least five different 9g servoes! I can understand the confusion, Rex. Apart from the 4.4g servo listed, any of these on this page would be suitable ( dimensions of about 24 x 24 x12 or a touch smaller is about normal for a '9g' - shown as a 'micro' servo on Timbo's chart at the start of this thread). Somewhere like Giantcod (who have stocking problems at present due to removal) list their servos by 'weight', so there is a choice of 0-9g here and 10-15g here. You'll see, for example, that the E-Power 12g metal-gear servo on the second page is the same dimension as the 9g's listed earlier - the metal gearing is the only difference. As ever, if you're not sure about a servo/application, just ask here - the answer will be readily forthcoming! Grrr... it's so bl.. frustrating! Physicaly the box fits the mounting bracket, but the drive spindle is too big for the control horn. So that equivalency chart, superficially usefull, obviously isn't unless it contains all physical measurement too. Coming from the IT world, I'm shocked that an activity that's been going for at least three generations is still too immature for componant standardisation. I've no idea how I'm going to get back in the air now. I've surfed a couple of sites looking at control horns, but no one stated the internal diameter of the splined drive spindle interface. I can understand your frustration but your new servos should be fine so long as you got all the 'bits'. You are right that servo arms often don't fit each other, which is why you should have had servo arms supplied with the Tower Pro's. When you swap servos you simply swap the arms as well. If you were not supplied with any then you should contact the supplier. Presumably, by control horn, you are referring to the servo output arm? If so, yes the splines on the output shafts are of all sizes, with little standardisation, so don't expect to be able to just swap the servo and casing. I don't think the chart is lacking - it just shows an approximation to give an idea of the type of servo that one may look for. This site is the natural progression from the chart - but I don't know of anywhere that lists output shaft details. What is the model and which servo needs replacing? And yes, I suppose I do mean servo output arm. Unfortunately, the servo came with a little bag of output arms, but none of them fit either. The heli is a Dynam E-razer 450, and it's the servo that controls cyclic (lift, elevator??). I ended up cutting the roses, the grass and digging the vegtable beds with it last weekend, and stripped the gears on the servo. So I'm a bit lost now, as I don't fancy ordering random out put arms in the hope of getting one that fits. I'm surprised that the arms don't appear to fit, though. They can be a very (underlined as we don't have that facility in the reply box now!! ) snug fit initially and a bit of wiggling should see them seated on the spline. To remove the arm, you often have to start to ease it away with a screwdriver tip, they are that snug. One issue worth mentioning. You have 3 servos to control pitch, roll and cyclic. A mix of servo types can make it very difficult to set up the heli as different types can behave differently in terms of throw, speed etc. It is much better to have a common type for the 3 servos. Given that learning to fly helis is a war of attrition, it may be worth getting a stock of servos so you can standardise all round. I see GC have them a silly price at present. Might be worth getting a few! You may, alternatively, prefer to go for metal-gear servos which might last a bit longer depending on the carnage! ps I don't know if you have the Dynam with the supplied Tx but if you do, you might find this page useful. its possible that the servo arms supplied with the servo don't fit - but to be honest its extremely unlikely! 1. As Pete says they can be a fairly tight fit onto the splined shaft. 2. (And I know this is going to sound really obvious - but let's go there anyway! Sometimes the obvious thing is the answer.) There are splined - so you might have to rotate the arm a tad left and right to get the splines to engage. This may mean that your servo arm doesn't seem to be in "right" position anymore. Do nothing until you've turned everything on. Then get the servo arm as close to the right postion as the splines allow and either adjust the linkage length to get your neutral (best way really) or do it on the Tx's sub-trims - a bit of a lazy way but works OK!